I know that a lot of Beluch lovers frequent this site; hence the reason for this post. 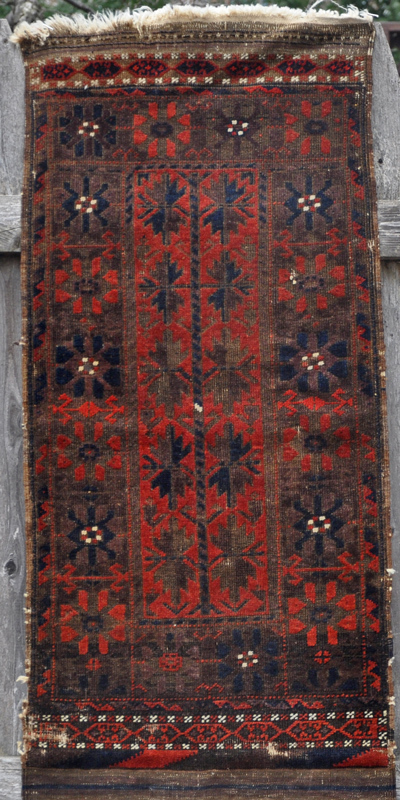 This rug has outstanding, wonderful wool and some of the most saturated colors I have seen on this genre. This balisht has 7(h) x 12(v) asymmetric, open right knots. I believe that the camel color is dyed wool and not camel hair. There is a 2 cord selvage wrapped in a figure-8 fashion with coarse brown hair. LOTS of similarities - an extra border or two. That's a nice one; I like the rosette main border very much. You are fortunate; your piece has led pretty comfortable life so far, as did the Boucher piece. Mine, on the other hand, apparently had to work for a living. The critters, a less common feature, caused me to overlook its woeful condition. Wool quality is actually quite good, and this one still has its back. Sorry to hear about all of the hard work to which it was subjected - looks like "slave labor". But the great graphics still are clear! I also note the white (wool?) while mine is clearly dark brown hair. Is this a measure of age, location, or anything else??? By "white (wool?) while mine is clearly dark brown hair" I presume you are talking about the selvage ? Mine had hair selvage as well, but most of it is now missing. 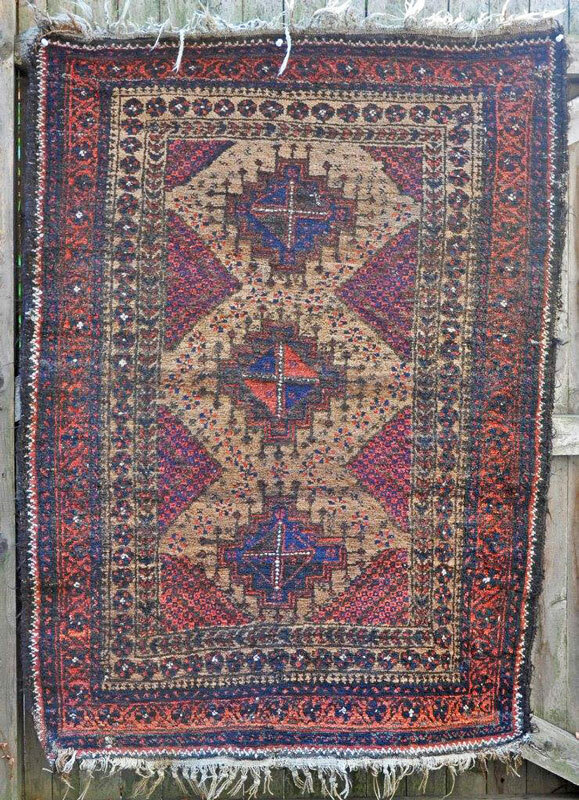 As for age, tough to judge, as with most oldish Baluch pieces. If we give some credence to Craycraft's thoughts, the simpler borders on yours are somewhat indicative of a nomadic rather than settled weaving environment. That assertion may have some reliable research behind it, but I am equally inclined to view simpler borders as possible age indicators as with Turkmen pieces. Either way, both pieces have some appeal. Sorry, I should have specified: I was asking about the weft. Yes: both are attractive; unfortunately, mine is missing the back. On mine the wefts are two shots of medium brown wool, both very loosely twisted. 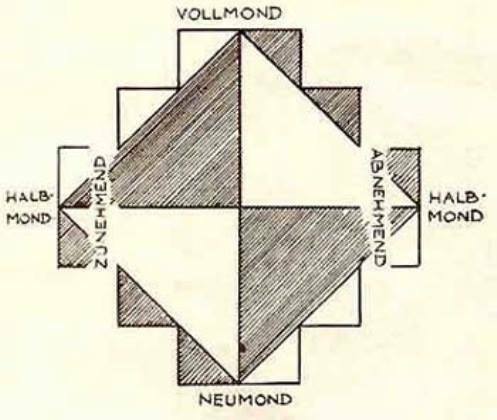 Knotting is asymmetric. I will be interested to see if Joel has anything to say; he focuses on Baluch work. While on the topic of balishts, take a look at this one, which I found several years ago. I assume it is Baluch. Interesting that this last balisht of yours is symmetrically-knotted. Until recently, I figured that SY-knotted 'Baluch' balishts were as uncommon as SY-knotted 'Baluch' khorjin. And then I started noticing them. I had found seven of them. Yours is the eighth. I like the wide borders on both Chuck and Joel's, and particularly the skirt on Chuck's. On the topic of Sy knotted Baluch work, I have read somewhere that it is commonly seen on "Arab Baluch" work. Not knowing what "Arab Baluch" meant, I did a little homework. 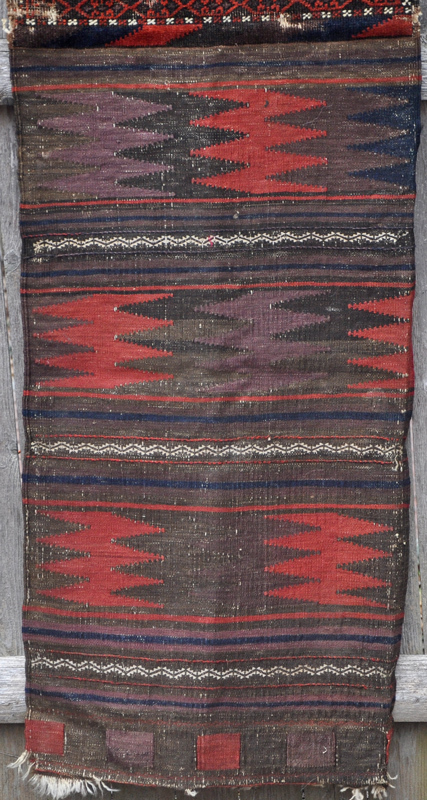 I learned that there are Baluchi people in Yemen, but I would be surprised if there are weavings from Yemen Baluchi's. So who are Arab Baluchi's, and is the statement about Sy knotting from them accurate?? On the topic of Sy knotted Baluch work, I have read somewhere that it is commonly seen on "Arab Baluch" work. 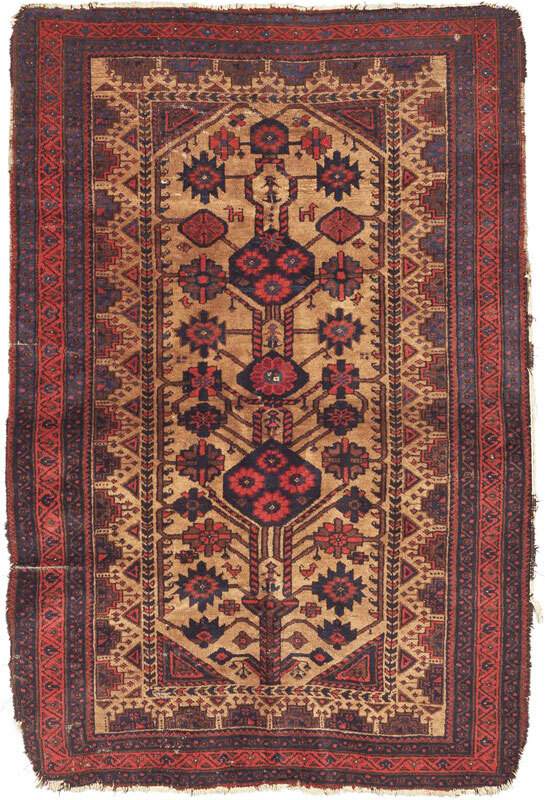 In terms of weaving, 'Arab Baluch' generally refers to a group of rugs woven in the southern Khorasan area near Ferdows. 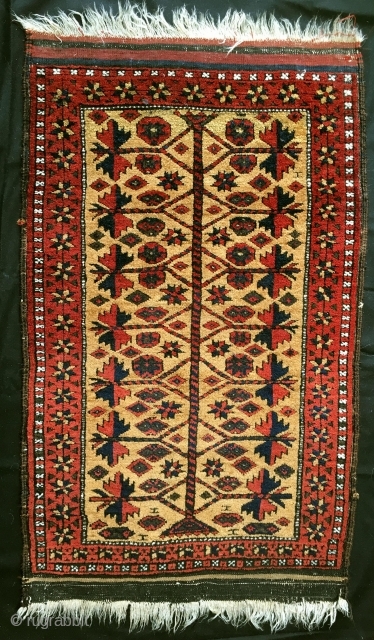 While most 'Baluch' pile weaving is asymmetric open left, and some from Khorasan are symmetrically-knotted, many 'Arab Baluch' rugs are knotted asymmetric open right. 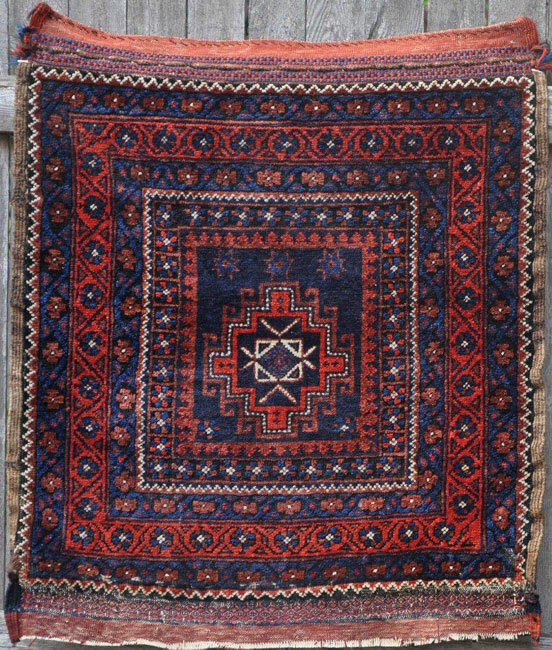 I don't know of any rugs that are thought of as 'Arab Baluch' that are symmetrically-knotted. Last edited by Joel Greifinger; June 1st, 2018 at 03:37 AM. On further thought, why 'Arab' if they are in Khorason province in Iran?? why 'Arab' if they are in Khorason province in Iran?? So, what does all that boil down to in terms of identifying a particular piece as "Arab Baluch" ? Ethnicity is one thing, an identifiable class of weavings is another. I guess I should have been a bit more specific; I have been aware of the presence of ethnic Arabs in eastern Persia for a long time, but have never seen a satisfying reading source on their weavings. No doubt you have seen what Edwards said about 'Arab' rugs within the greater 'Baluch' matrix. 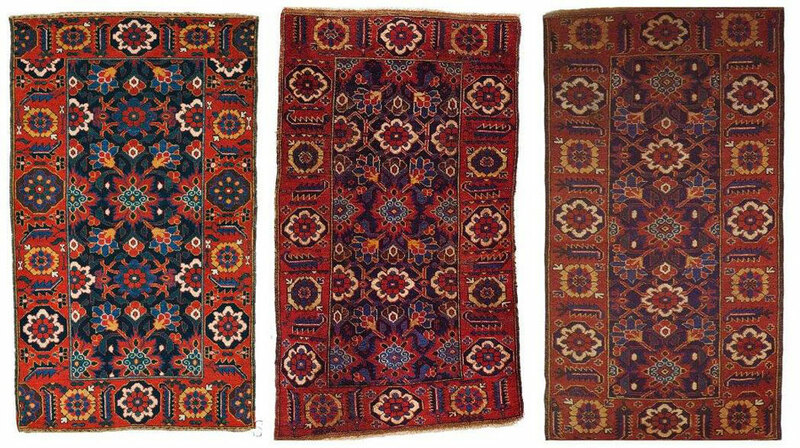 He implies a distinction between such rugs and 'true' Baluch rugs, but he doesn't do much more to inform the analysis. He also provides several of his familiar black and white illustrations, including a half dozen or so which he tags as Arab, but they don't help (me!) very much. 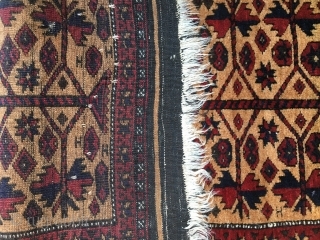 A prominent issue that must be recognized regarding commentary on Baluch rugs by the estimable Mr. Edwards is the few but significant errors committed in the book, such as that Baluch rugs (including the Arabs) are single-wefted, or that the warps (and wefts) of the older ones were mostly black, until they moved over to cotton. It is difficult to reconcile these lacunae with the otherwise generally excellent work of the author. Last edited by Rich Larkin; June 2nd, 2018 at 06:39 PM. This one has another common field design and has what are called 'half-moons' as the main border, another typical element. 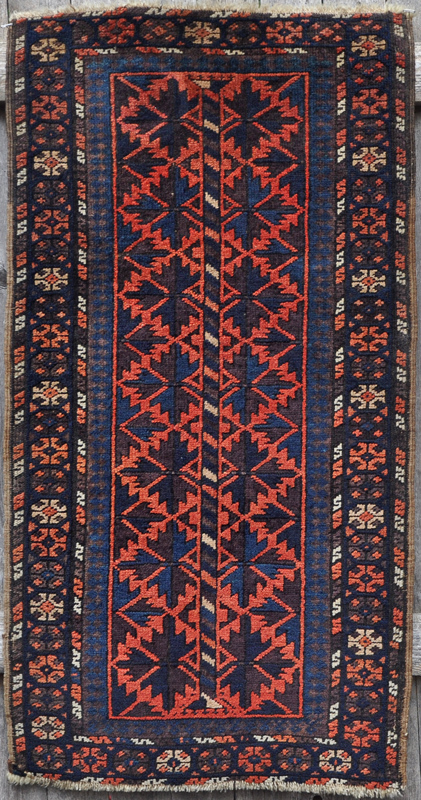 A whole other type attributed to Ferdows, and often also called 'Arab Baluch' are these rugs with herati patterns that are usually woven on cotton warps. 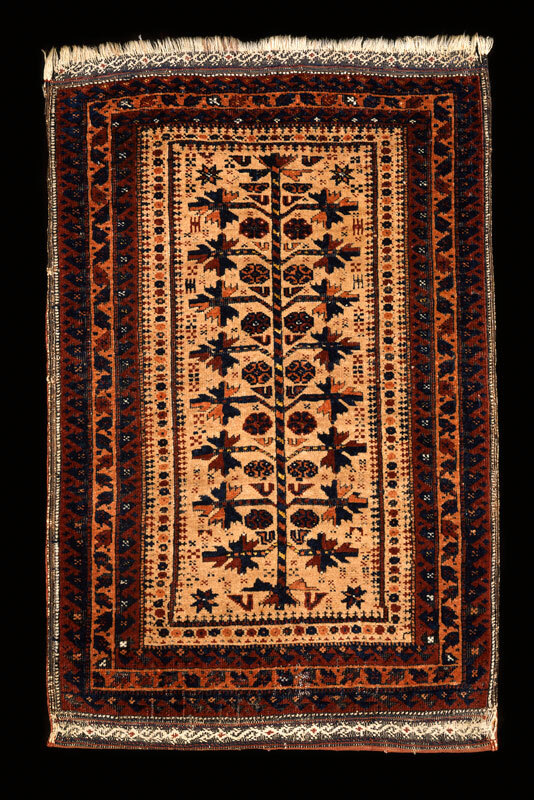 'Arab Baluch' rugs are the only group of seemingly older 'Baluch' rugs that were sometimes woven with cotton warps. And, since the thread started with a balisht, let me say that I've never seen an 'Arab Baluch'-looking balisht.